The Ultimate Family Beach House - 6BR/4.5BA, Private Pool, direct beach access, toys, bikes, playroom - Awesome! Gulf Coast Getaways is proud to welcome Anne's Island Girl to our excellent inventory of incredible vacation rentals. The Island Girl is a well known favorite on Pensacola Beach and has been loved by many families over the years. The house has been under private management and is now being introduced into our company as a professionally managed incredible Beach House. The Island Girl boasts one of the best lots on Pensacola Beach. Located at 1301 Ariola the house faces to the South, Southwest with nothing blocking the great beach view. 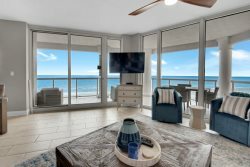 There is no house in front of the view and the beach access is a county deeded access point which makes going to the beach an easy few steps away. The house is best known for it's great surplus of amenities: Game room downstairs with: ping pong, pool table, Hot Tub, tiki bar, extra fridge, basketball game, large grill, over 10 bikes, pool toys, beach equipment, and everything needed for you beach vacation. Literally, just show up with your clothes and food and you will be set. The house has beautiful travertine tile throughout. We offer for you to enjoy a private lagoon-shaped pool, hot tub and tiki bar, nicely equipped game room with pool table, Ping-Pong, Foosball, etc. as well as bikes, beach chairs, and beach towels, and wagons. We have six bedrooms that include two kings, three queens, and a full down/twin up bunk bed set as well as a loft with two twin bunk bed sets and four baths. For the little ones we have two pack-n-plays a toddler bed, highchair and lots of toys. Besides having a very large kitchen dining and living area combination on the main level we also have a separate smaller living area and kitchenette upstairs. All rooms have brand 2018 smart TVs just purchased from Best Buy.. The main living area has a 60-inch high definition TV. We also have wireless high-speed Internet access. Pensacola Beach and the surrounding area offer many options for you and your family to have a very memorable week. Large Private Pool. Kids toys and at least 10 bicycles. Ping pong table, basketball game, hot tub, and other games in the downstairs playroom. Clear beach view, no house obstruction and straight across beach access.